One of the bright spots of military life is never having to figure out what you will wear for work. It is mandated: you will wear a uniform. Yet that isn’t as simple as you might think, as the military has a vast array of uniforms. Service members joke that a secret cabal must exist that does nothing but dream up new uniforms or variations of uniforms, possibly as a prop to the U.S. textiles industry. Opening screen of Uniformity. 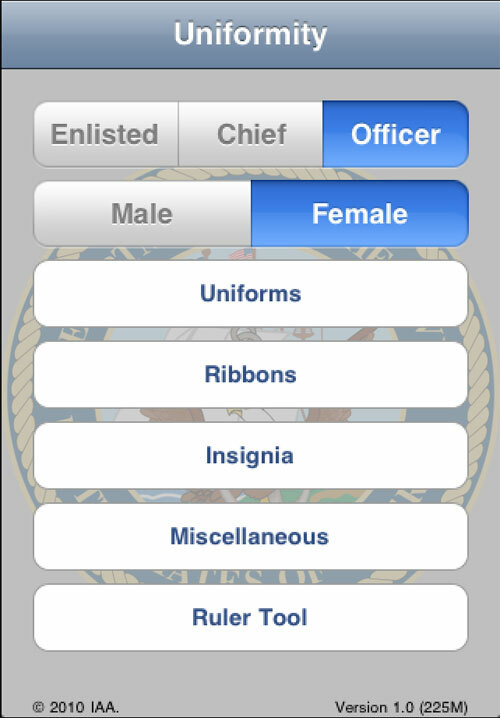 The current version supports all U.S. Navy uniforms, officer and enlisted, male and female. Terrance Goggin, CEO of PocketMac, a software company, says he watched in frustration as his spouse, a Navy officer, attempted to properly assemble a dress uniform. While regulations do document how to assemble any given uniform, the regulations are not exactly user friendly, not assembled in a notably logical fashion, and extend for hundreds of pages. There is occasional cross-referencing, but it seems to be designed to obfuscate as much as illuminate, and to add one final bit of confusion, uniform regulations differ in subtle ways for men, women, officers and enlisted. The Uniformity ribbon tool allows you to select the ribbons you are entitled to wear and then places them in correct order of precedence. The possible permutations of uniforms are almost infinite. 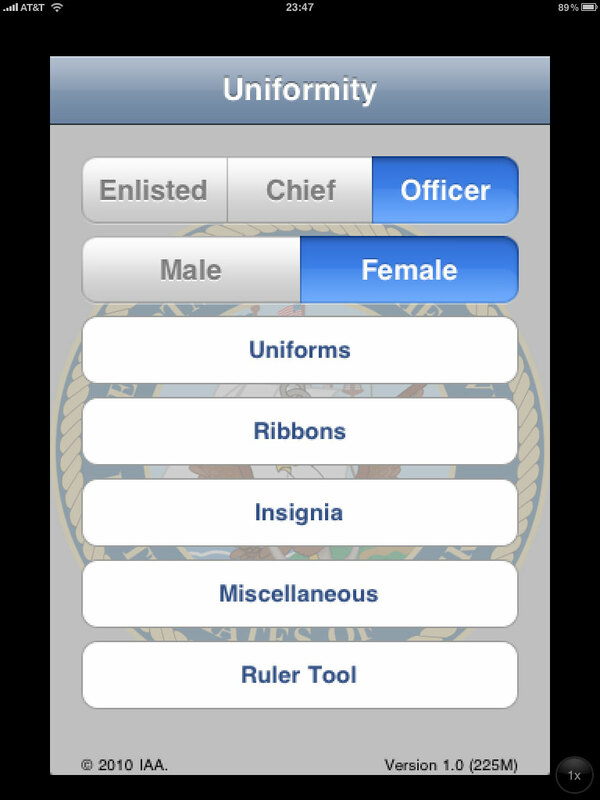 To take one example, female Navy officers have at least 22 different kinds of uniforms. These differ in subtle ways from the 22 different uniforms of male Navy officers, or the 21 different uniforms of male chief petty officers, which in turn differ from – let’s just say that the goal of “uniform” seems to have been lost long ago. 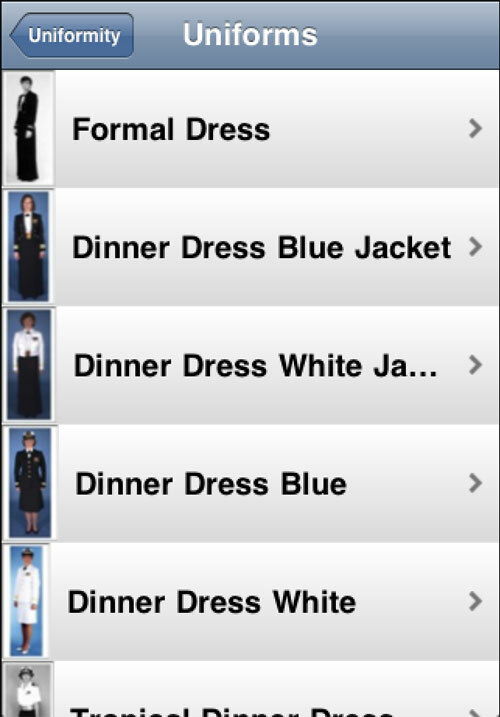 Uniformity displays all 22 uniforms authorized for female Navy officers in a lengthy scrolling list. 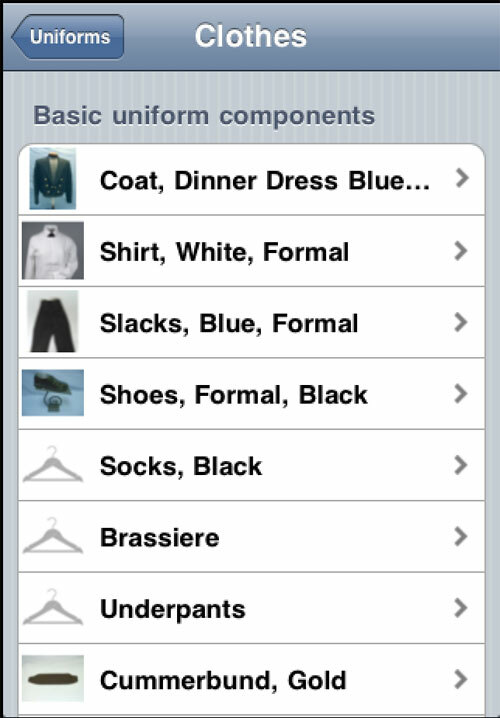 Select any uniform to see the component pieces. Each uniform consists of many pieces, each of which must be worn exactly as prescribed. If the iPhone, iPad, or iPod touch had existed while we were in Japan, PocketMac’s Uniformity app would have answered virtually every question. Every possible Navy uniform is included, for officers, chief petty officers, and enlisted, both male and femal, complete in most cases with photos. 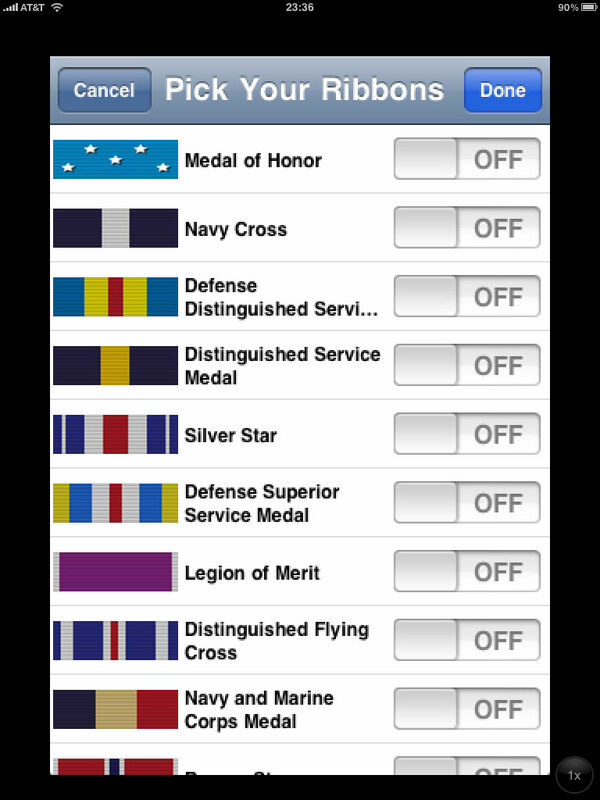 When exact placement of a medal or ribbon or button or insignia is important, diagrams are provided, and a tap on “Ruler Tool” turns the iPhone or iPod touch into a ruler – assuming you don’t need to measure a distance of more than 2 ¾ inches. For insignia and device placement, that’s more than adequate. 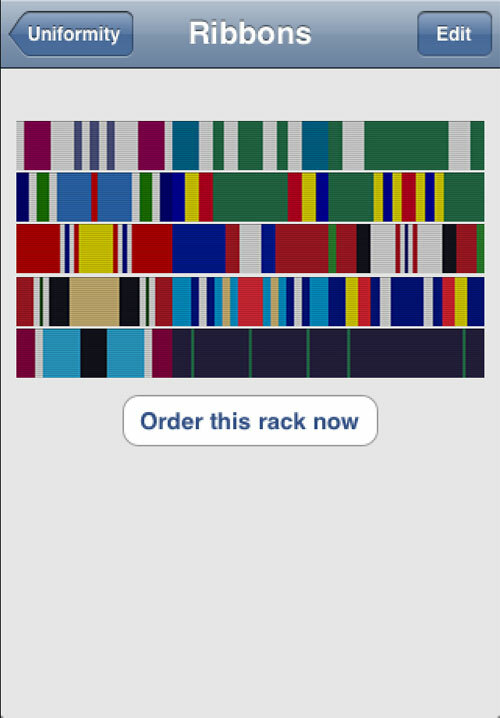 Uniformity shows how to arrange five rows of ribbons for a service member that had served in Kosovo, Afghanistan, Iraq, a humanitarian mission, and received some specific commendations, in addition to qualifying with a rifle and pistol. While most of the application consists of hundreds of pages of regulations boiled down to dozens of screens of description and illustration, an exception is the ribbon tool. When a service member gets a medal, they also get a cloth ribbon that can be worn in lieu of the medal. Medals tend to clang a bit, weigh down your shirt or jacket, and generally get in the way, while ribbons are pinned flat against the uniform and, as long as the pins don’t pop off, tend to be far less trouble. But figuring out the order of precedence for ribbons (and medals) can give you a headache. 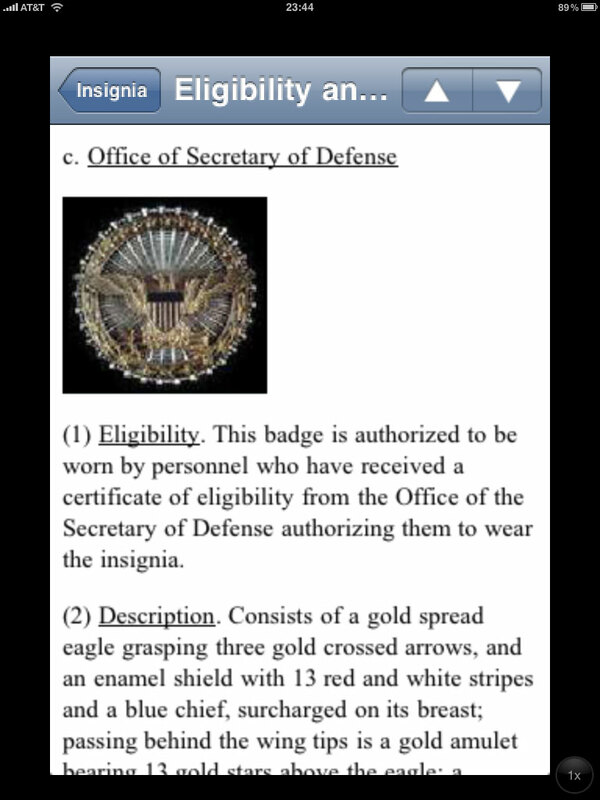 Military staffers in the Office of Secretary of Defense are authorized to wear this badge, which is gigantic. 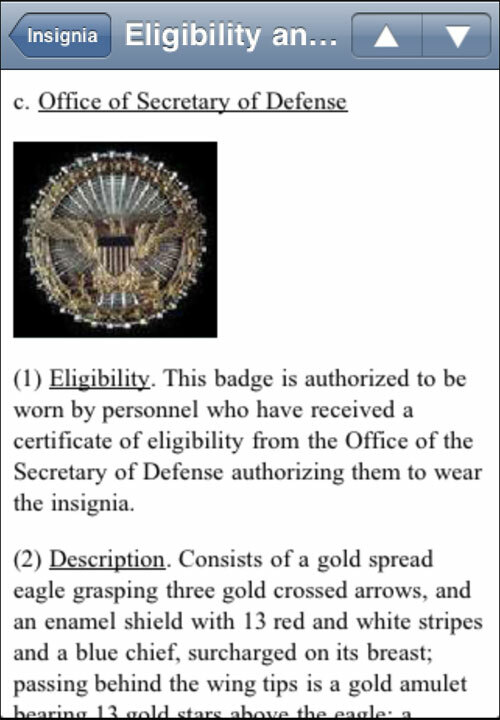 Several years ago, regulations required the badge to be worn over the breast pocket, but women service personnel refused, saying it made them look like Xena, the warrior princess with her armored brassiere, and they wore it above the pocket, instead. Uniformity notes that it is now official: men wear it centered on the left breast pocket, but women wear it ¼ inch above the left pocket. Uniformity’s ribbon tool makes arranging ribbons almost fun. Pick the ribbons from a lengthy, scrolling list and, when you’ve selected all those you’ve been awarded, press “done” and Uniformity draws them in a proper “rack,” ordered by precedence. 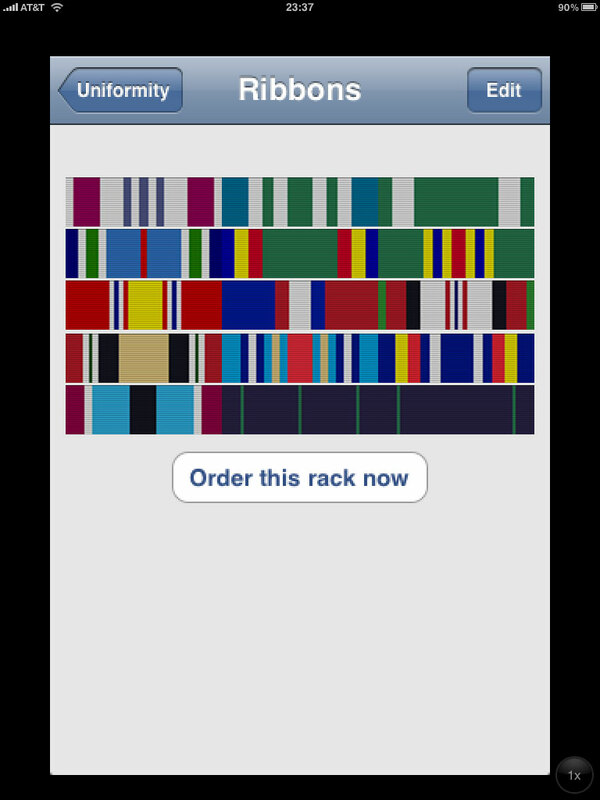 You can then press an “Order this rack now” button and be sent to a Web site that allows you to buy a pre-assembled rack of ribbons, properly arranged. 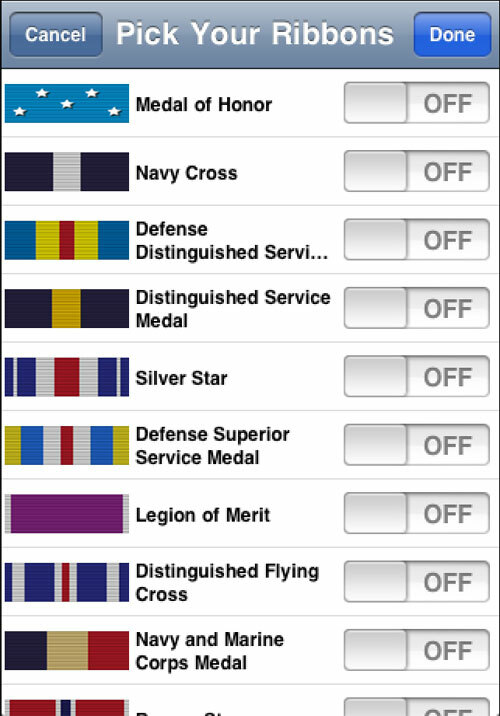 Or, if you have the individual ribbons on hand, you can use the image on your iPhone or iPod to arrange the ribbons on your uniform. About the only thing it doesn’t handle are the stars for repeat awards, the “E” or “S” pins for expert and sharpshooter rifle and pistol ribbons, and similar un-uniform variations on uniformity. 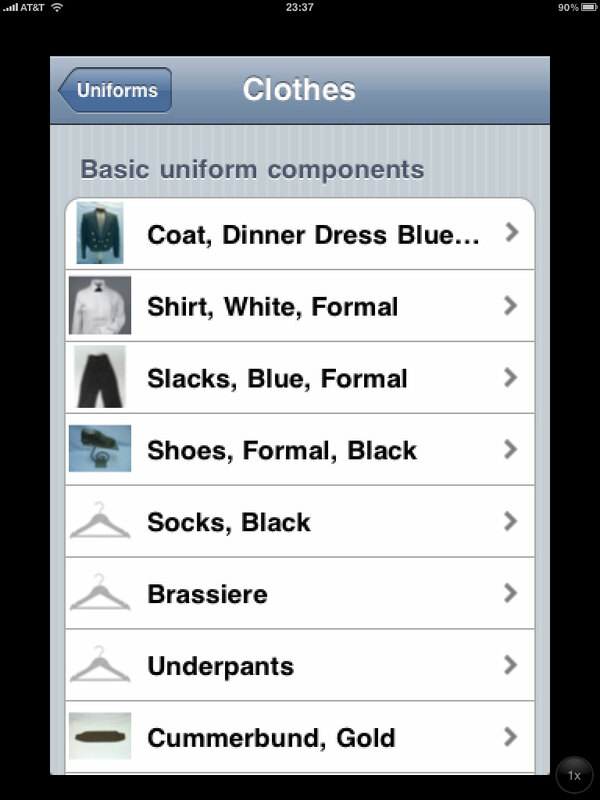 Uniformity is $5.99 through the App Store. A free version, which has just the ribbons tool, is available as Ribbons, also through the App Store. The Uniformityapp Web site suggests that versions for the Army, Air Force, Marines and Coast Guard are under construction, a potential boon for joint service morale. 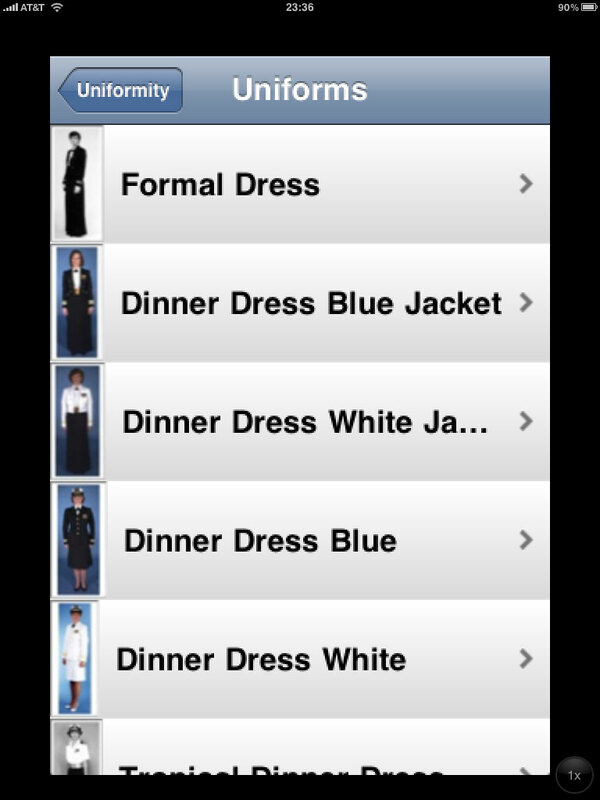 Uniformity works on the iPhone, iPod touch and iPad, though the ruler tool isn’t all that useful on an iPad. Recommended for anyone in Navy service, or with a spouse in Navy service.